Braxton and Payne have been lovers for three years. They are still very much in love, but due to horrific childhood trauma, Payne suffers from some pretty major sexual dysfunction. Rather than either man risking triggering Payne’s mental demons, when the mood strikes them, they invite a third into their bed. Well, Payne’s bed, because Brax just watches; anything to keep Payne happy. At least that was the pattern…until they meet Flame. I really didn’t expect to enjoy this book as much as I did. I rarely see survivors of sexual trauma accurately depicted in a realistic manner. Especially not the type of abuse that Payne endured. And I speak from almost twenty years of dealing with victims professionally. 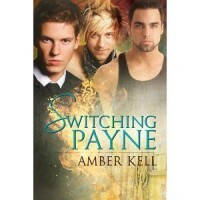 But, I think Amber Kell did a pretty good job with Payne. I also really like that Brax and Payne were given a reasonable time to build their relationship, before adding a third. And even then, all three men are open with their attraction and their concerns. Which made me believe their ménage could work outside the bedroom. The characters are very well crafted. And, by that I mean, they complement one another. Where Brax is straight alpha male, Flame is more nurturing. Both men are obvious with their devotion to Payne, but we also see them begin to develop a relationship that is separate, if not quite equal. Amber Kell never ceases to amaze me with her mastery of the novella. For all its heavy subject matter, Switching Payne is not maudlin. Neither is it sappy sweet. It’s just a really nice romance between three wounded men, who somehow make it work for them. Highly recommend.